When Amanda Stewart Davidson (B.A. ’04, trombone) was in ninth grade, she wrote a paper for school detailing her ideal future. It went something like this: Go to Juilliard. Play in an orchestra. Marry a trumpet player. Though she wed a fellow trombone player—Mark Davidson— instead, Amanda got the rest just right. She started playing the trombone when she was just 6 years old, and her passionate devotion to the instrument from such a young age has clearly paid off. In September 2009, just three months after she and Mark married, Amanda won one of the most competitive and coveted jobs in the field and was named the associate principal trombone of the New York Philharmonic—becoming the brass section’s first female member. Previously, she was principal of the San Antonio Symphony (2004-09) and assistant principal of the Lyric Opera of San Antonio (2005-09). In a recent interview with oboe doctoral candidate Toni Marie Marchioni, Amanda, 28, spoke about her new job, her new husband, and their shared passion for pizza. 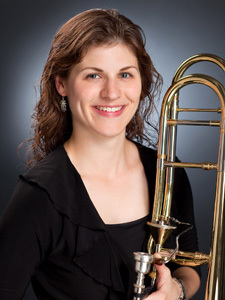 Amanda Stewart Davidson (B.M., '04, trombone), the associate principal trombone of the New York Philharmonic, is the first woman to join the orchestra's brass section. What’s it like being married to somebody who plays the same instrument? The first time I met Mark, it was when he beat me at an audition. I congratulated him, but in the back of my mind I was thinking “grrr.” But then, the San Antonio Symphony had a one-year position open for second trombone, and [New York Philharmonic principal trombonist and Juilliard faculty member] Joe Alessi recommended Mark. He came down, and within two months of him being there, we started dating. I kept thinking, “How could this be?” I never thought I could date a trombone player because I knew at that point I was extremely competitive. And he was also competitive. Our first date was actually at a Dave and Buster’s arcade. We were playing air hockey and got so competitive that the disc would fly off the table and hit people! But as we grew to love one another, the competition went away. At times, it has been hard, especially when we would take the same auditions. You want to win yourself, but because you love the other person, you want them to win as well. So it is an internal struggle. I am just happy that I am not going to be taking any auditions for a long time, and we don’t have to have that scenario again. Now, we play duets, and we play for each other. After you finished your studies at Juilliard, you were away from New York for five years. When you won this job, what about the city made you most excited that you were returning? Any particular cuisine that New York does best? Well, pizza! Pizza is one of my favorite foods. I am trying not to eat it because I love it so much. My gosh, there are not many places that have pizza like here. It’s funny because Mark and I kind of made it our mission to find the best pizza of New York. Especially after we got married, we went on this food binge and ate a lot of it. Clearly the pizza here is better, but do you miss Texas? I do, actually. I miss open space. Here, everything is really cramped, and there are people everywhere. It’s not that I want to get away from people, but it’s just so congested. Especially in certain parts of the city, there’s not a sense of calm, serene. And I can’t look up at the night sky. I can’t sit on my back porch. You know, I had a house in San Antonio. I sold it when I moved here, and now I have a really, really tiny apartment that I pay twice as much for! How does it feel to be a colleague to your former teacher from Juilliard, Joseph Alessi? I still get nervous around him, just because I did study with him for four years. Now I come to work expecting that I am always going to learn something from him. He is probably the pre-eminent trombonist in the world, and there aren’t very many people who can do what he does. He’s just fantastic. It can be nerve-wracking, but I’m adjusting to that, the part where I’m a colleague. I don’t feel like I’m his equal, so I’m always coming to learn. I always come with a sense of humbleness. Technically, he’s my boss. But it’s great—I enjoy working with him and he treats me really well. It’s a privilege. What is your favorite thing about being a member of the New York Philharmonic? Being able to come to work and learn from my colleagues. I sit there every day and am amazed at how people turn a phrase. Sometimes they are just so creative and it’s not what I expect. Plus, you have these people who have completely mastered the technique of their instrument. Usually, I am sitting in the orchestra thinking, “Wow, someday I hope I can play like that. It’s perfect.” Every day I come to work, I am more and more encouraged and hope it rubs off on me, that I become more and more like them.